Sealpoint Siamese have dark brown points and a mocha-colored coat. Siamese cats are intelligent, interactive and loquacious, and for these reasons and more they have their fans. The beauty of their pointed coats, their (sometimes crossed) baby blue eyes and that distinctive "meow" is unmistakably Siamese. Finding one to adopt takes time, patience and a little creativity. Visit Siamese Rescue online (at siameserescue.org) and spend a little time perusing their website. A national organization, Siamese Rescue has a network of foster homes and breed-specific shelters all over the country where Siamese cats are housed waiting for permanent homes. Their network of volunteers include people who are willing to transport Siamese cats over long distances, so if you cannot drive to where your Siamese cat is, your new cat will come to you. Siamese Rescue also sponsors the Siamlist, where people who have Siamese cats for adoption but don't want to place them in rescue place ads and those looking to adopt a Siamese respond to the ads. You can also find links to Siamese rescue groups not affiliated with Siamese Rescue. 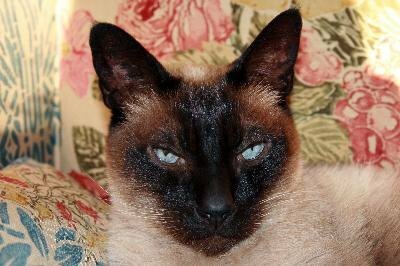 Go to your local humane society, rescue organization or county facility and check to see if a Siamese has been turned into their shelter. Because Siamese cats are so people-centric, they don't "show" well in shelters. They become despondent and sit in the back of the cage. To avoid this, some shelters call Siamese Rescue to come remove Siamese cats from the shelter to be placed in their foster network. However, if you visit the shelters frequently and ask to be put on a waiting list so they call you next time a Siamese cat is turned in, you are well-positioned to adopt the Siamese before the breed-specific rescue is called. Check Petfinder (petfinder.org) often and post an ad on their discussion lists. Petfinder maintains a database of adoptable animals in shelters all over the United States. This user-friendly system allows you to input your zip code and specify a radius of how many miles you are willing to travel. Using a drop-down list, you select criteria such as gender and age. The database will return photos and descriptions of Siamese cats and kittens, as well as contact information, for all the shelters and rescue groups within a pre-specified radius of your zip code. Spread the word among your friends and family using social media outlets such as Facebook and Twitter. Leave a card with every veterinarian, groomer, pet-supply store, doggy day care or other animal-related businesses with your contact information and the kind of cat you are looking for. Tell your hairdresser, your neighbors and your church or community members. Educate yourself on the many kinds of Siamese cats and hybrid Siamese cats there are so you know what you are looking for. For example, would you prefer a long-haired Himalayan or a short-haired lilac point? Siamese cats are not for everyone. Despite their undeserved reputation, they are not aloof. They will want to be with you and are quite talkative, which can be annoying when you are trying to sleep or concentrate.